My Indian Version: Is Your Color Coding Method Working for You? These beautiful colors create a mess if overdone and can sometimes get overwhelming. So, how to feel less overwhelmed? Exactly this is what we will see today. Plus, there are bonus tips to customize your color coding style in planner or bullet journal! WHERE TO USE COLOR CODING? 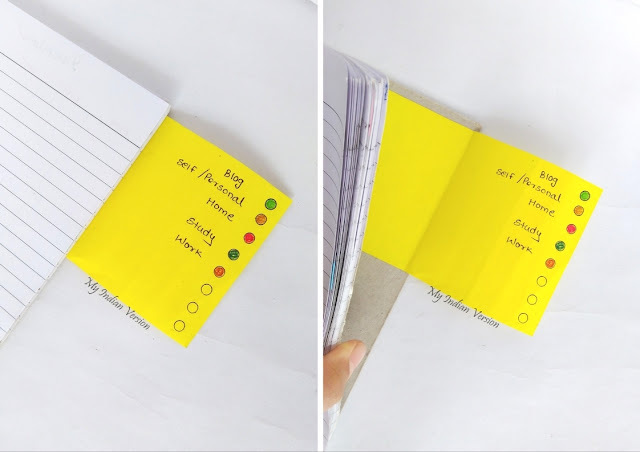 Earlier we discussed color coding in planners. But color coding is also useful in organizing your email labels, apps, and calendars. If you decide to use color coding in more than one place, then try to synchronize the color scheme, if possible. When you have same categories in different places, having the same color for the category make your job easier. You have one less thing to remember. Say, you have work related tasks in three different places; in your planner (daily to-dos), calendar (reminders), and email. And you color code work = blue in your planner. Then, keep the same blue color for work related tasks in your calendar and email. So, whenever you see a task in blue anywhere in the planner, calendar or email you know it is work related. You don't need to read the task to find its category. 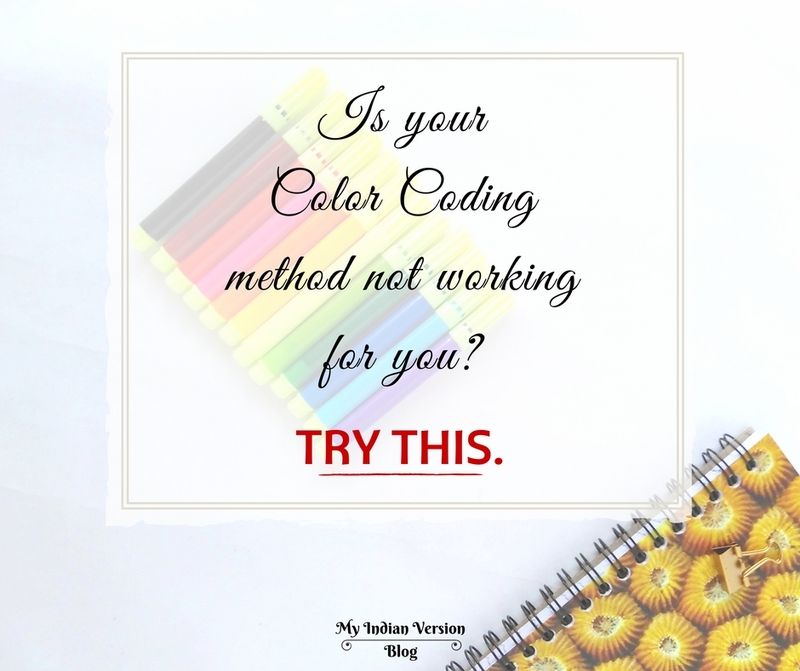 It is completely ok if you decide to color code only your planner or calendar. You don't need to do what others are doing. Understand what you need, choose your own color coding system and love it. Being said that, starting with minimal approach will keep you in control. Starting with a dozen of colors for a dozen of things will only leave you feeling overwhelmed soon. So, be easy on yourself and start as minimalist. You can start with color coding five different areas of your life (eg. self, family, work, home, and others) in your planner first. Then when you feel comfortable with the system, you may start using the same color coding in your calendar or organizing apps. Also, you can add more categories as you need. So how many days will it need to be comfortable with the system? Give yourself at least 10 days to feel used to. If it works, then keep expanding as per needs (not compulsory tough). If it did not work, scrap it and take a different color coding system. 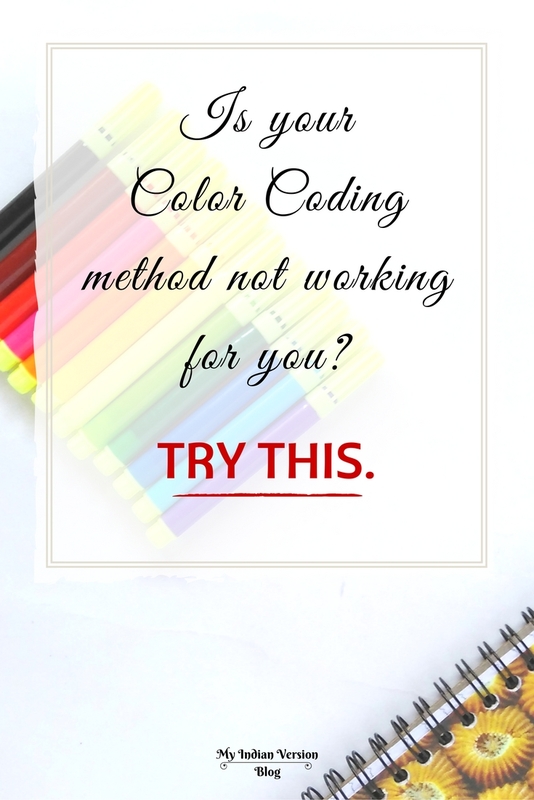 Yes, allow yourself to change a color coding system if it does not fit your needs. If something is not working, then better to respectfully remove it, and try a different approach! After one-two trials, you will find your color coding system. Feel free to create your own style. Keep the part that works and remove that doesn't. No one is going to ask an explanation for it! Terra Brown from Earn Spend Live shares more insights on planner color coding. Take time and read it at least once. Create a legend for your color coding system. Legend is a color chart where your will write, which color is assigned to which category / priority / time. Add it to your planner or message board till you remember the combination. I use the flip out page in my bullet journal. Commonly, while color coding we write the task with assigned color pen. But you can do it differently. Here are the two ways I like to use. Write the task in black color pen and then color a circle/ checkbox in front of each task (to represent its category, priority, time). Or you can create a group of related tasks and then write them under the corresponding colored box. Ignore those red dots drawn after few tasks, in the below pic. I will talk about them in upcoming series. Similarly, you can outline the task or group of related tasks in the assigned colors. 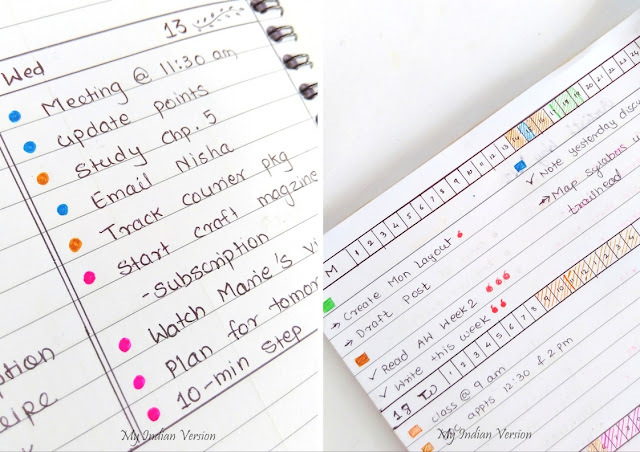 The outline is more appealing in monthly or week-at-a-glance layouts. So are you ready to get organized a bit more?! Yes! Great gal! If you have any questions regarding color coding, freely ask them in the comments section.